The country of Vietnam is experiencing an economic transformation and optimism infuses every aspect of life, including classical music. Pittsburgh Symphony Orchestra violinist Zhan Shu, cellist Bronwyn Banerdt, and I were invited to participate in a two week musical and cross cultural journey in Vietnam this past August, where we joined musicians from Vietnam, US, China and Taiwan to give five concerts in the country’s two largest cities, Ho Chi Minh City and Hanoi. The music festival, started in 2015 by a friend and classmate of Shu’s, was titled Vietnam Connections this year. Details about programs and musicians bios can be seen here. 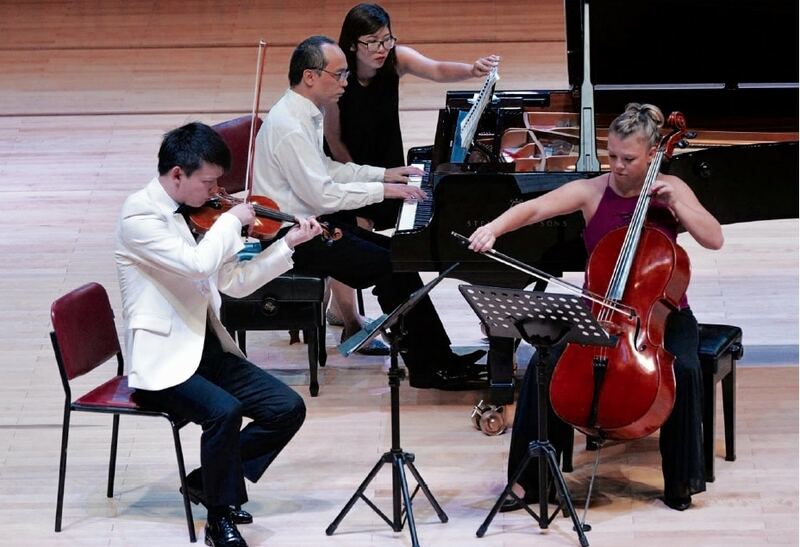 The first concert at the Ho Chi Minh City Conservatory, titled “Zhan Shu and Friends” featured Shu playing seven Vivaldi concertos including the Four Seasons and three other concertos featuring two or more violins. It was a solo marathon for Shu and it was great to hear him play and represent the PSO. His performance was masterful and elegant, and justified the PSO’s world wide reputation for high caliber players. A review of the concert can be read (in English) here: http://english.thesaigontimes.vn/49077/Vivaldi-and-Bach- triumph-in-HCMC.html. Most of the festival musicians were a mixture of the country’s most distinguished classical musicians who serve as soloists, concertmasters, principal players, and professors of Vietnam’s top institutions. Vietnam tourism industry accounts for 9.3% of GDP and there are American tourists everywhere. Almost every Vietnamese person I met spoke English. We took in Vietnam’s amazing food, coffee, unbelievable traffic (there are 8 million people living in Ho Chi Minh City and 7.4 million registered motor bikes), pagodas, temples and night markets, but the best experience was connecting with Vietnam’s people through music. The opportunity to share music with people in Pittsburgh and around the world is truly a privilege. One of the nicest things to see in the audiences in Vietnam was the abundance of children in attendance. Nearly 90% of Vietnam’s population is under 54 years old. At the conclusion of each concert every musician on stage was given a bouquet of flowers by one of many children who swarmed the stage. The Philadelphia Orchestra in 1999 was the first major American orchestra to perform in Vietnam since the end of the war in 1975 and the New York Philharmonic visited 2009. With Vietnam thriving and welcoming the world, perhaps the PSO will be the next American orchestra to receive that welcome. Sign Up For Our Newsletter, Appassionata!